What are the signs and symptoms of chronic kidney disease? (CKD)? 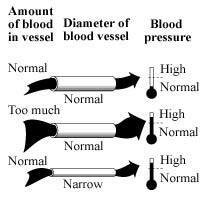 High blood pressure is the excessive force of blood placed against blood vessel walls. High blood pressure damages the vessels that, in turn, can't provide the waste and fluid exchanges in organs, especially the kidneys. Most individuals have no obvious signs or symptoms of high blood pressure: blood pressure is measured with a blood pressure cuff reading the diastolic (highest pressure at heartbeat) and systolic (lowest pressure as heart fills with blood). Most normal diastolic and systolic pressures are 120/80, respectively, while 149/90 is considered by most to be high blood pressure (all pressures are in mm Hg units). Early kidney disease also has no outward signs or symptoms, however, measures of GFR (glomerular filtration rate), creatinine (waste product) and protein in urine aid in the diagnosis of kidney damage. Keeping blood pressure below 130/80 helps prevent kidney damage. Lifestyle changes and medications can reduce and control high blood pressure. Risk factors for kidney failure due to high blood pressure include people with diabetes, African-American race, obesity, high alcohol intake and a poor diet and sedentary lifestyle. Ongoing clinical trials may improve ways to reduce kidney disease related to high blood pressure. The kidneys play a key role in keeping a person's blood pressure in a healthy range, and blood pressure, in turn, can affect the health of the kidneys. High blood pressure, also called hypertension, can damage the kidneys and lead to chronic kidney disease (CKD). Blood pressure measures the force of blood against the walls of the blood vessels. Extra fluid in the body increases the amount of fluid in blood vessels and makes blood pressure higher. Narrow, stiff, or clogged blood vessels also raise blood pressure. High blood pressure makes the heart work harder and, over time, can damage blood vessels throughout the body. If the blood vessels in the kidneys are damaged, they may stop removing wastes and extra fluid from the body. The extra fluid in the blood vessels may then raise blood pressure even more. It's a dangerous cycle. 1United States Renal Data System. USRDS 2007 Annual Data Report. Bethesda, MD: National Institute of Diabetes and Digestive and Kidney Diseases, National Institutes of Health, U.S. Department of Health and Human Services; 2007. Hypertension can result from too much fluid in normal blood vessels or from normal fluid in narrow, stiff, or clogged blood vessels. Most people with high blood pressure have no symptoms. The only way to know whether a person's blood pressure is high is to have a health professional measure it with a blood pressure cuff. The result is expressed as two numbers. The top number, called the systolic pressure, represents the pressure when the heart is beating. The bottom number, called the diastolic pressure, shows the pressure when the heart is resting between beats. A person's blood pressure is considered normal if it stays at or below 120/80, which is commonly stated as "120 over 80." People with a systolic blood pressure of 120 to 139 or a diastolic blood pressure of 80 to 89 are considered prehypertensive and should adopt lifestyle changes to lower their blood pressure and prevent heart and blood vessel diseases. A person whose systolic blood pressure is consistently 140 or higher or whose diastolic pressure is 90 or higher is considered to have high blood pressure and should talk with a doctor about the best ways to lower it. An eGFR with a value below 60 milliliters per minute (mL/min) suggests some kidney damage has occurred. The score means that a person's kidneys are not working at full strength. Another sign of CKD is proteinuria, or protein in the urine. Healthy kidneys take wastes out of the blood but leave protein. Impaired kidneys may fail to separate a blood protein called albumin from the wastes. At first, only small amounts of albumin may leak into the urine, a condition known as microalbuminuria, a sign of failing kidney function. As kidney function worsens, the amount of albumin and other proteins in the urine increases, and the condition is called proteinuria. CKD is present when more than 30 milligrams of albumin per gram of creatinine is excreted in urine, with or without decreased eGFR. The National Heart, Lung, and Blood Institute (NHLBI), one of the National Institutes of Health (NIH), recommends that people with CKD use whatever therapy is necessary, including lifestyle changes and medicines, to keep their blood pressure below 130/80. Diet: eat fresh fruits and vegetables, grains, and low-fat dairy foods. Sodium: limit their daily salt, or sodium, intake to 2,000 milligrams. They should limit frozen foods and trips to fast food restaurants. They should read nutrition labels on packaged foods to learn how much sodium is in one serving. Keeping a sodium diary can help monitor sodium intake. Exercise: get plenty of exercise-at least 30 minutes of moderate activity, such as walking, cycling, or swimming, most days of the week. Alcohol: avoid consuming too much alcohol. Men should have no more than two drinks-two 12-ounce servings of beer or two 5-ounce servings of wine or two 1.5-ounce servings of hard liquor-a day. Women should have no more than a single serving a day because differences in the way foods are broken down in the body make women more sensitive to the effects of alcohol. Many people need medicine to control high blood pressure. Several effective blood pressure medicines are available. The most common types of blood pressure medicines doctors prescribe are diuretics, angiotensin-converting enzyme (ACE) inhibitors, angiotensin receptor blockers (ARBs), beta blockers, and calcium channel blockers. Two of these medicines, the ACE inhibitors and ARBs, have an added protective effect on the kidneys. Studies have shown that ACE inhibitors and ARBs reduce proteinuria and slow the progression of kidney damage. Diuretics, also known as "water pills," help a person urinate and get rid of excess fluid in the body. A combination of two or more blood pressure medicines may be needed to keep blood pressure below 130/80. The National Institute of Diabetes and Digestive and Kidney Diseases (NIDDK), also part of the NIH, sponsored the African American Study of Kidney Disease and Hypertension (AASK) to find effective ways to prevent high blood pressure and kidney failure in this population. The results, published in the November 20, 2002, issue of the Journal of the American Medical Association, showed that an ACE inhibitor was the most effective drug at slowing the progression of kidney disease in African Americans. While ACE inhibitors help reduce the risk of kidney disease, they are less effective in lowering blood pressure in African Americans than in Caucasians. 2United States Renal Data System. USRDS 2007 Annual Data Report. Bethesda, MD: National Institute of Diabetes and Digestive and Kidney Diseases, National Institutes of Health, U.S. Department of Health and Human Services; 2007. The NIDDK's Division of Kidney, Urologic, and Hematologic Diseases supports basic research into normal kidney function and the diseases that impair normal function, including diabetes, high blood pressure, glomerulonephritis, and polycystic kidney disease. SOURCE: National Kidney and Urologic Diseases Information Clearinghouse. High Blood Pressure and Kidney Disease.